Four new law undergraduates have been selected to take part in this year’s mentoring scheme run by the Yorkshire team of Ward Hadaway and the University of York’s Law School. 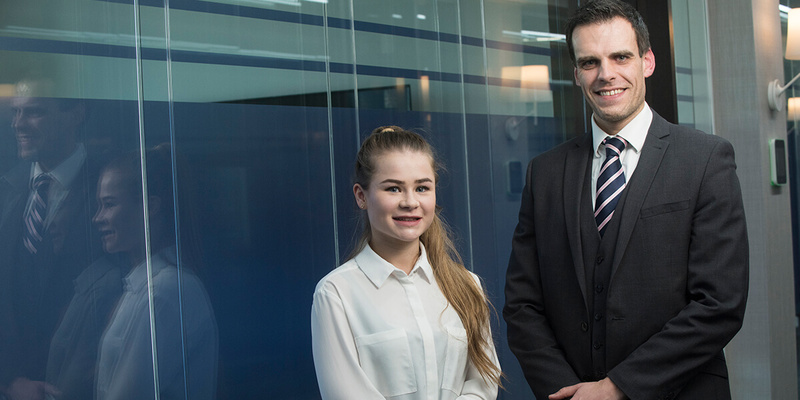 The Top 100 law firm, which has offices across the North, in Newcastle, Leeds and Manchester, has been involved in the joint initiative since 2014, during which it has mentored more than 20 students. The scheme was set up to develop a mentoring scheme in Yorkshire which focused on the needs of students in the higher education sector. It provides students with access to dedicated mentoring support from qualified lawyers based at Ward Hadaway’s Leeds office. Three mentors, Simon Thirtle, Laura Potts and solicitor Sarah Stockdale, will support the students through their undergraduate and postgraduate studies in law, by providing career advice and sharing their experiences of the legal profession. Simon, an associate in the Property Litigation team at Leeds, has been involved in the scheme for the past three years. He said: “The scheme is always well received by students from the University’s LLB programme applying for a place. “It offers both value and reward for anyone keen to pursue a successful career in law. A number of the students we have mentored over the years come from a background where they are often the first in their family to attend university. Others are keen to pursue a career in the legal profession but are nervous or unsure about how to do this. “Our aim is to give students the tools and confidence to achieve the next step of their career goals – it’s great to be able to fulfil our firm commitment to promoting and encouraging the next generation of lawyers. “Any of the University of York law students can apply to join the scheme by providing us with a CV and covering letter. We then review all applications and select four students each year to be mentored through their studies. Ward Hadaway has already met with all of the mentee recruits for 2018 and will give advice throughout the year as to the training contract application process and how the mentees can best prepare themselves so that they have the best possible chance of success in what is a highly competitive marketplace. Each of the mentees also has the opportunity to undertake a week’s work experience at the firm, with placements in up to three different departments, offering first-hand insight into the workings of a large, full service, commercial firm. As well as the mentoring scheme, Ward Hadaway holds ‘link days’ with the University during which eight students get the chance to visit the offices for two days each to find out what it’s like to work at a law firm.